Prime is inspired by the great pizza makers of NYC at places like Di Fara, Patsy's and Best. Our goal is simple: to bring truly great NY-style pizza to our hometown of Los Angeles. We start our dough with the highest quality AP and 00 flour, then let it ferment for a full 24 hours to develop that true, homemade flavor. After that, we stretch it by hand, top it with local, California tomatoes and all-natural Grande mozzarella from Wisconsin. No fillers. No gimmicks. Just pizza. tomato sauce, mozzarella & seasonal veggies. Or do it the old fashioned way and call (323) 852 1188. OUT OF OUR ZONE? We're on Postmates. "Prime serves up downright delightful slices, albeit with a few more veggie options than I remember my Brooklyn shop having (know thy audience). But the best part? 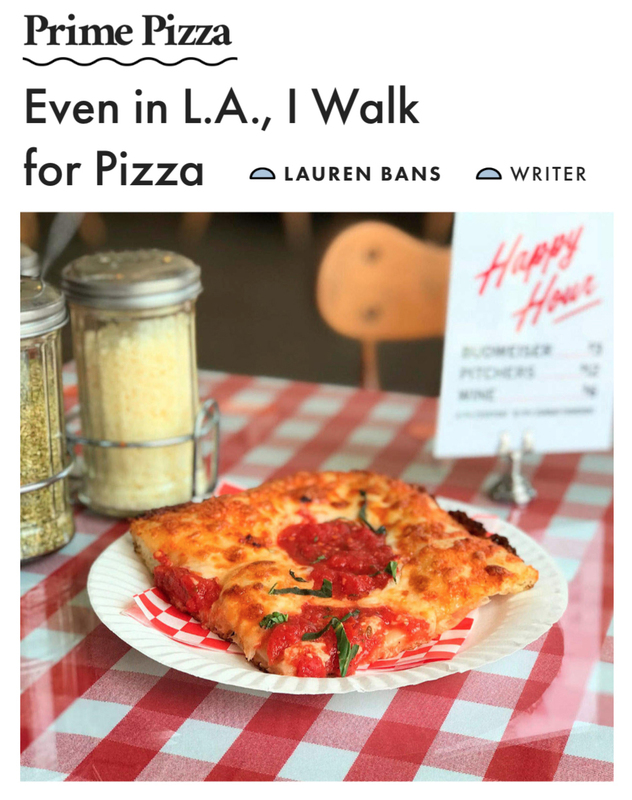 I can throw on my headphones and head there on foot, NY -style, which I figure burns off at least a fourth of the pizza calories, L.A.-style."